Singapore is famed for it’s delicious food and delicacies! Streets and stalls of local delights are waiting for you to discover it! Join us on a ride through the heartlands as we introduce to you the different local dishes! Enjoy famed, Hainanese Chicken Rice Balls, Katong Laksa, Hokkien Prawn Noodles (what my dear French mate likes to call, Seafood Noodle) and many more! 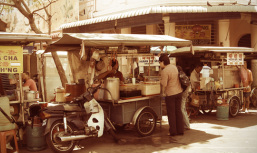 Food Hop with us as we visit different stalls and meet locals along the way.. Great way to see Singapore and fill your tummy at the same time!